According to his earlier 1852 marriage record (Providence, Rhode Island)2 Lemuel K. Preston (said age 24) then resided Boston, Mass., supposedly a "superintendant of telegraph." Within seven months of the marriage, he was in Texas, working to raise funds and engineer telegraph lines under Galveston Bay. His name is given, spelled and/or indexed in different ways3, but that hasn't prevented me from locating information about him later. Sigh. Despite a host of attempts, I have NOT been unable to locate this Lemuel Preston just prior to or about the time of his 1852 marriage. Biographical information about Lemuel K. Preston is included below. How can I fix this problem? The Texas and Red River Telegraph Company was founded in 1852 and based in Shreveport, Louisiana. 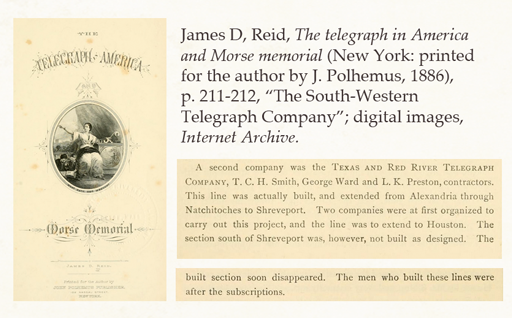 See Jimmy Burns, "The Texas and Red River Telegraph Company," Crown Jewels of the Wire, October 2000, p. 10 (reprint). News item of 13 Nov 1852 by L. W. Cady (agent for F. A. 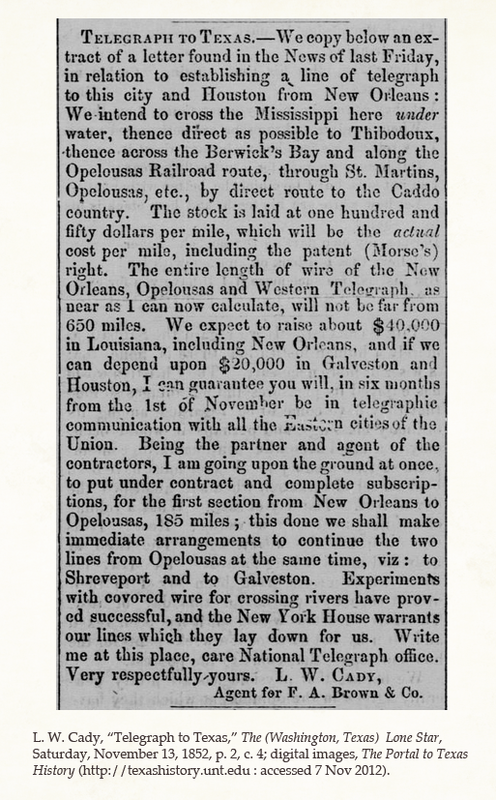 Brown & Co.) reports plans for the telegraph from New Orleans to Houston, estimated about 650 miles at a cost of $150/mile. Mentions covered wires for crossing rivers and says "the New York House warrants our lines which they lay for us" (graphic follows). Acts passed by the First Legislature of the State of Louisiana held and begun in the town of Baton Rouge ... January 1853 (Baton Rouge: state printer, 1853), p. 322-325, "(No. 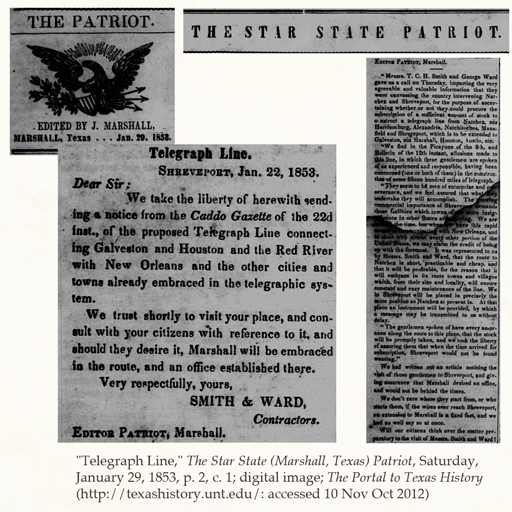 341) An Act to incorporate the New Orleans, Red River and Texas Telegraph Company and Branches," 30 April 1853, particularly p. 322 for 15 persons named to form the telegraph company. Those named are from New Orleans, Lafourche, Assumption, Ascension, Baton Rouge, St. Mary and Lafayette (Louisiana); p. 324 names trustees as L. W. Cady, W. W. Pugh and Benj. P. Crane. 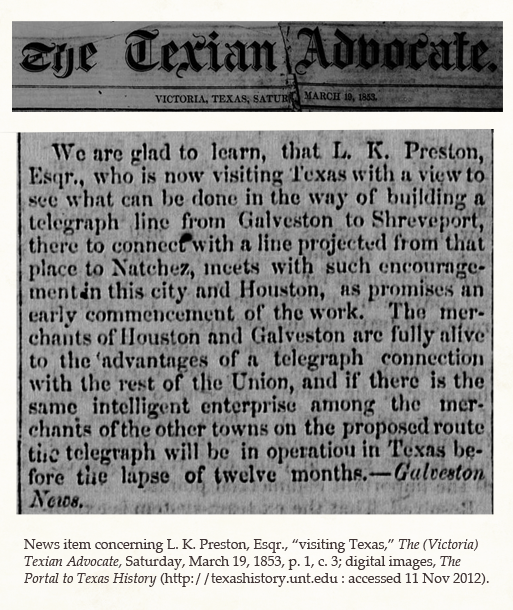 "The first telegraph lines in Texas," The Telegraph Age 1 (January 1902): 7 (viewed as composite, Wire & Radio Communications 19: 7, "The first telegraph line in Texas, buily chiefly with Galveston and Houston capital, was from Galveston ... to Houston [...] The chief actors in this work were T. C. H. Smith, a telegrapher of the day of prominence; C. A. Burton, a long time engineer, conductor and superintendant of the Houston & Texas Central Railway before and after the war, and afterward superintendent of the Texas and New Orleans road; Mr. L. K. Preston, an old ante-bellum citizen of Houston, and, I think, the venerable city treasurer of Houston was also connected with this work. He was a telegrapher in his native country, Hungary, too long ago to talk about." Separate research in Google Books provides a reference to T. C. H. Smith's full name as "Thomas Church Haskell Smith." In 1852, Lemuel married Sarah J. "Josephine" (Burton) Estabrook (ca1832-1864). She is identified in the marriage record as Josephine Easterbrook, ae 19, residing Boston, daughter of Amos Burton.2 Sarah J. (Burton) Estabrook seems otherwise daughter of daughter of Amos Burton and his wife, Sarah Merrill.5 Sarah J. 's first husband, Silas Estabrook, was probably the Boston printer by that name who died at San Francisco, California, 24 November 18496; he seems associated with his own bit of fame and mystery. The family resided Galveston, Texas, in 1860. Sarah Josephine10 and her son11 died in November 1864 during a yellow fever outbreak. Lemuel remarried in 1865 to Alice A. Duer; yet more children were born to his second marriage including a son, Lemuel Keyser Preston, Jr. The elder Lemuel and family resided Calvert, Robinson County, Texas, at 1870 and also at 1880. L. K. Preston died at Calvert, Wednesday, 12 January 1881 (obituary follows). His widow, Alice, long survived him; she died at Beaumont, Jefferson County, Texas, 23 Oct 1925. Chas. H. Dillion, "Inventor's Offer of Perpetual Patent Rights to Telegraph Ignored by Texas Republic," undated news item [1950-1960] from unknown paper; digital images by Frank W. Shiels (Fort Worth), Crown Jewels of the Wire, April 1983 Archives (Letters to the Editor); relays L. K. Preston's involvement with the telegraph, timeline and recounts news articles of the day. Shiels reports the article was located in Galveston (Texas) "City Archives." City of Providence (25 Dorrance Street, Providence, RI 02903) to GeneJ, information supplied telephonically by John Myers, Archivist, and Doyin Joseph, 21 November 2008; reports Preston-Easterbrook marriage 28 Aug 1852 by T. C. Cook, cites "Marriages performed in Providence," vol. 6 (1851-1870), pg 80. Indexed record as "Lemuel K. Preston"-"Josephine Easterbrook," in "Rhode Island Marriages, 1724-1916," database; FamilySearch.org. Lemuel's 1852 marriage record reports his parents as "Michael and Mary Preston." Separately, Michael Preston married Mary Merrill in June 1816 ["Marriages," The (Concord) New Hampshire Patriot, 18 June 1816, p. 3, c. 3]. No record has been found reporting about Mary (Merrill) Preston's death, but she has been listed as the mother on records about Lemuel's siblings. Michael married again Newton, Mass., 18 Oct 1838 to Mary E. Kenrick. Michael died of Hill, New Hampshire, 18 Sept 1849 [1850 U.S. census mortality schedule (Grafton Co., New Hamsphire) and Sue Armstrong, tombstone photograph] His widow is probably the Mary Preston at Hill, New Hamsphire in 1850 and 1860; at Newton, Mass in 1870. She died 17 Mar 1880 at Newton. Amos Burton and Sarah Merrill were married at Warren, New Hampshire, 12 Sept 1819 by Thomas Whipple, Esq. (The groom's name appears "Amos Barton, Jr." on the certificate; a son, William Allison Burton was born at Warren not long after the marriage.) Perhaps a year before the Burton-Merrill marriage, Michael Preston had sold his trading operation at Warren to an Amos Burton [Little, History of the Town of Warren, N.H. (1854), p. 164-165], likely the same Amos who then married Sarah Merrill. (Michael Preston had acquired the trading operation a few years earlier from the estate of his late brother-in-law, Lemuel Keyser, Jr., [m. Elizabeth Preston]. See William Little (1833-1893), The History of Warren: a mountain hamlet ...." (1870), p. 444-445. “Marriages and Deaths in California: from the Alta California, Dec. 1,” news item concerning death of Silas Eastabrook, "24th ult." [24 Nov 1849], The (New York) Evening Post, Monday, January 14, 1850, col. 1-2; digital images, GenealogyBank (www.genealogybank.com : accessed 27 Oct 2012). Research continues, but circumstantial evidence suggests that Sarah (Burton) (Estabrook) Preston was the daughter of Sarah (Merrill) (Burton) Baldwin who died 18 January 1889 at Houston, Texas, and who was the mother of Charles A. Burton. [Her obituary, Dallas (Texas) Morning News, January 20, 1889, p. 14; also FindAGrave, memorial for the son, Charles A. Burton]. Charles obituary reports that he came to Houston in the 1850s (possibly in 1853). In the US census of 1870 [Sarah M. Baldwin] and 1880 [Sarah Burton], Sarah Baldwin was living at Houston, Texas, with her son (Charles A. Burton). When daughter "Ella L. Baldwin" m1 Dr. Alva Connell, Jr. (at Houston, 1870), news of the marriage called Ella "a sister of our friend, Capt. C. A. Burton." ["Married," Union (Houston, Texas), Monday 19 Dec 1870, p. 3.] Sarah (Merrill) (Burton) Baldwin's son Charles A. Burton died 19 Dec 1884. 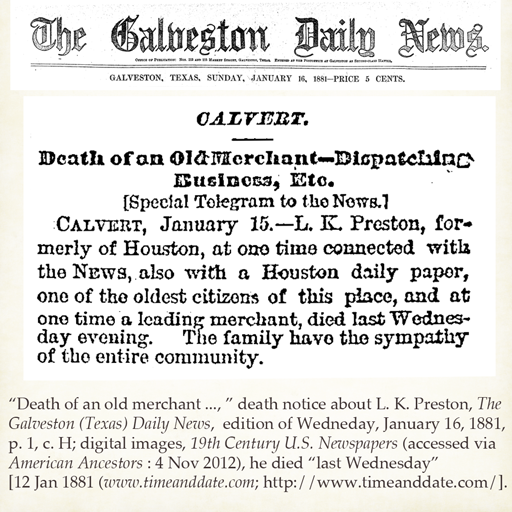 ["Death of a prominent Houstonian," The Galveston (Texas) News, November 20, 1884, p. 2, c. 6; also FindAGrave memorial.] No record of death has been located for Sarah's first husband, Amos Burton, but indexed marriage record for one "Sarah Burton" and "Henry Baldwin" (1836 at Boston) appears in "Massachusetts Marriages, 1695-1910." Incomplete or conflicting information is reported about Sarah (Merrill) Burton in Alfred Poore's, *A Memoir and Genealogy of John Poore ...(1881). The latter source says she removed to Lexington, Michigan, and married again (p. 201). I have yet to find traces of Sarah at Lexington. Charles H. Dillon, “The Arrival of the Telegraph in Texas,” The Southwestern Historical Quarterly 64 (July 1960-April, 1961): 204-5; digital images, The Portal to Texas History (http://texashistory.unt.edu/: accessed27 Oct 2012). Dillon's “The Arrival of the Telegraph in Texas,” remarks about the difficulties faced by the telegraph operation. In 1856, L. K. Preston published an open letter about his inability to keep the service operating. [The Weekly (Houston, Texas) Telegraph, Wednesday, July 2, 1856, p. 2, c. 2]. 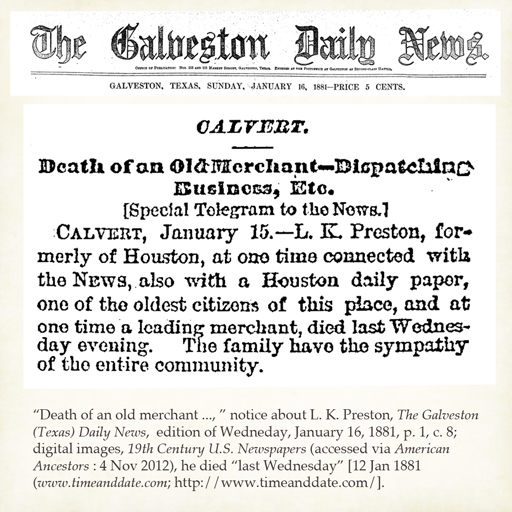 Dillon's article reports L. K. Preston later went on the staff of The Galveston News; that he was "well known by the late George B. Dealey of the Dallas News." Traces of these associations exist in news items of the day and in his obituary. Death notice about "Mrs. L. K. Preston," The Houston (Texas) Tri-Weekly Telegraph, Friday, November 18, 1864, p. 4, c. 4; digital images, University of North Texas Libraries, The Portal to Texas History (http://texashistory.unt.edu/ark:/67531/metapth235066/ : accessed November 04, 2012). Death notice about "Edwin Winfield [Preston]," The Houston (Texas) Tri-Weekly Telegraph, Friday, November 9, 1864, p. 4, c. 5; digital images, University of North Texas Libraries, The Portal to Texas History (http://texashistory.unt.edu/ark:/67531/metapth235066/ : accessed November 04, 2012). One angle of attack would be to research telegraphy-related news and organisations in Boston around 1850. Also, it is possible that he was in Texas, but returned north to marry? The speed with which he relocated to Galveston after his marriage suggests he already had connections there. ColeValleyGirl adds: "Another mention, 3rd column, reports he was in Houston on 4 March 1853; in [New-York daily tribune, March 18, 1853, p. 6, c. 3][James D, Reid, The telegraph in America and Morse memorial]. Not the answer you're looking for? Browse other questions tagged united-states 19th-century new-england texas or ask your own question. Identifying Lemuel K. Preston's 1830s-era birth place of “Broome, L. C.”? Would there be 1830-1850 US naturalization records for children born Canada to parents born in US when relocating back to US? What does the term “Intervale” mean in the context of New Hampshire land transactions and deeds? What were the rules about Massachusetts town marriage intentions ca 1811? Making sense of conflicting death dates for Juliet D. (Strong) Wilder? How to find a slater named Patrick M Golden in 1870 records?